Because I love a list. Especially a random (ish) list. 1. If you’re reading this and don’t live in Augusta, welcome to golf week. That’s why you’re here, right? 2. If the weather pans out according to the 10 day forecast, I’m sorry. You missed the perfect weather last week. 3. If the weather people are wrong (and with a 50/50 chance, anything’s possible), you’ll probably notice a fine yellow dusting on your cars and chairs, in your beers and eyes, and hanging in the sky over the big golf course. The sunshine’ll make up for it, though. 4. If you notice things looking a little less shady (referring to the sun, not sketchy behavior) around here, it’s not mind trick. We lost thousands of trees during the ice storm/earthquake week. Right here around the golf course, most of the debris is gone, but go out of town just a bit, and you’re sure to see tall piles of limbs. 7. Please wait patiently if you’re stuck in a line or waiting for a table. We have a few extra people in town. Feeling antsy? Order another drink. This too shall pass. 8. Speaking of ordering another drink, did you know that the cutoff for beer sales on the golf course used to be 4pm? There was a mad rush to the concession stands at 3:59. Thank goodness we don’t have to do that anymore. Now it happens at 4:59. 9. If you plan on drinking more than one beer out there, you must decide if you’re a stacker or not. 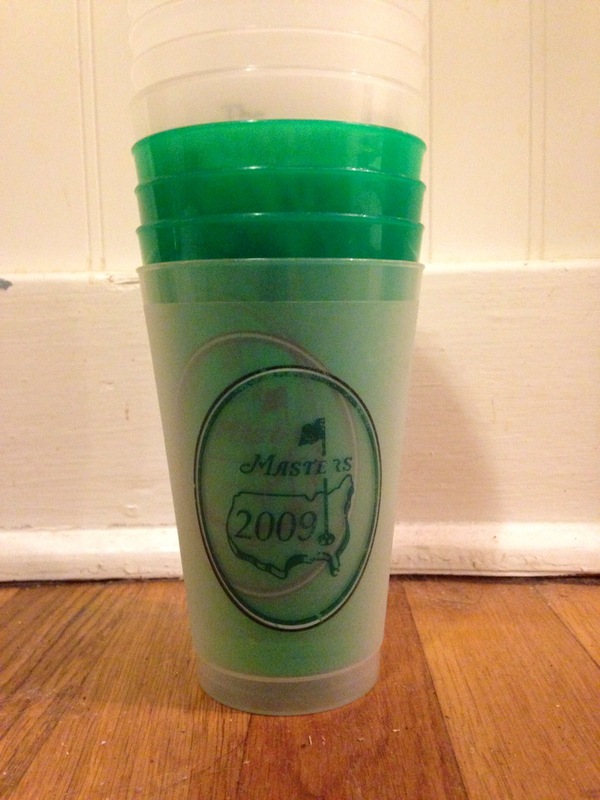 A stacker keeps all of his/her souvenir cups, carrying around a tower of green cups. Rarely is a tall tower handled with grace. Don’t be afraid to buy something in the pro shop, just so you’ll have a bag in which to carry said tower. 10. Not interested in golf? Just came to shop? Go early in the week. Once the droves of practice round fans have come through, the pro shops are pretty picked over. 11. If you just came to shop, pay attention while you’re out there. You’ve got your hands on a well sought after ticket, and it might be a good idea to watch a little golf. You might surprise yourself and like it. Years ago, when I went for the first time, I didn’t know a shank from a chip shot. 12. Walking up to Amen Corner that year, I got it. It’s beautiful out there, and the sport isn’t nearly as boring as you’d think. As an aside, I recently learned the same thing about NASCAR. Well, except the beautiful part. It’s fun to watch, though. 13. That was the year Tiger won for the first time. He’s not coming this year, due to a recent back surgery. It was announced on April Fool’s Day. I guess there’s still a chance he was kidding, even though all sources say he isn’t. Like him or not, his absence will be notable. 14. Wear golf shoes if you have them, and if not, wear running shoes. Trust me on this. You don’t want to slip and fall and be That Girl. Your friends aren’t gonna go home with you just because you slipped in the mud. Dress appropriately, too. Your “White Trash” tank top won’t cut it. 15. When eat doubt, eat more egg salad. Or pimiento cheese. Or ham on rye. Whatever butters your biscuit. Don’t forget the cold beer. It’s Tunamint Week, y’all! Welcome to Augusta!